Deutsches Eck (German corner) in Koblenz / Coblence at the meeting of the Rhine and Moselle rivers. 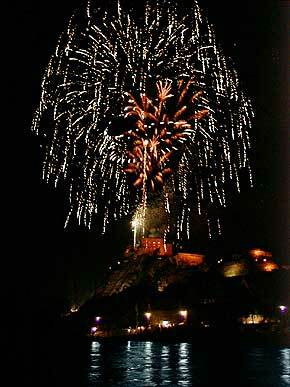 Big firework with colorful programm in the Rhine and Moselle rivers region from Koblenz, Coblence also in Spay, Braubach, Rhens und Lahnstein. 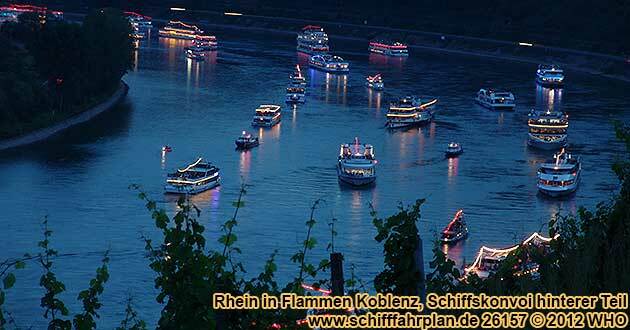 Boat parade and fireworks along the Rhine river  you'll experience the spectacle. About 80 Rhine river ships with 30.000 people on board glide from the Bopparder Hamm to the Deutsches Eck (German corner), past romantic half-timbered houses, castles and palaces, all bathed in the light of the "Bengal Fire." 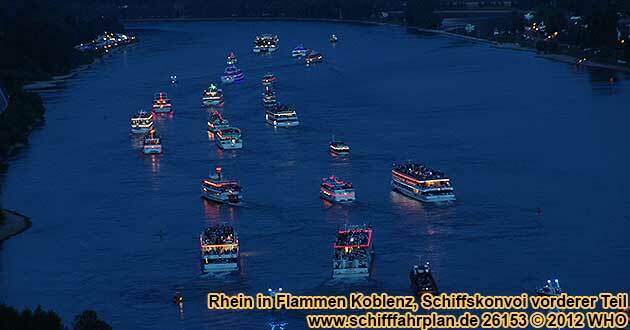 9:30 p.m.: The boats gather together for the boat parade north of Boppard in the Boppard Hamm. 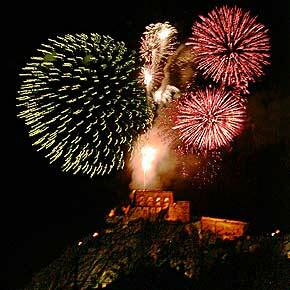 at approximately 11:00 p.m.: Finale fireworks from the fortress Ehrenbreitstein across from the Deutsches Eck (German corner) at the mouth of the Moselle river. Embarkation in Linz on the Rhine river (right Rhine river side) from 2:45 p.m., departure 3:00 p.m. Party with DJ music and dance on board. Return in Linz on the Rhine river about 1:15 a.m. Boat tickets together with welcome drink, buffet and drinks per person 157 EUR. Embarkation in Andernach on the Rhine river (left Rhine river side) from 4:30 p.m., departure 4:45 p.m. Party with DJ music and dance on board. Return in Andernach on the Rhine river about 12:30 a.m. Boat tickets together with welcome drink, buffet and drinks per person 157 EUR. Embarkation in Ober-Lahnstein on the Rhine river (right Rhine river side) from 5:35 p.m., departure 6:00 p.m. Seating place below deck on a passenger boat, DJ music and dance on board. 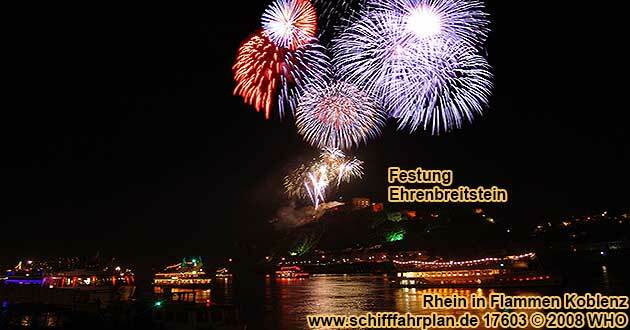 Return in Ober-Lahnstein on the Rhine river about 12:15 a.m. Boat tickets together with welcome drink, 2-course menu and drinks per person 137 EUR. Embarkation in Linz on the Rhine river (right Rhine river side) from 1:25 p.m., departure 1:30 p.m. Party with live music and dance on board. 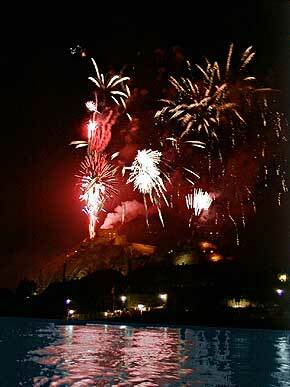 Return in Linz on the Rhine river about 1:40 a.m. Boat tickets together with 2-course menu per person 107 EUR. Embarkation in Andernach on the Rhine river (left Rhine river side) from 3:00 p.m., departure 3:30 p.m. Party with live music and dance on board. 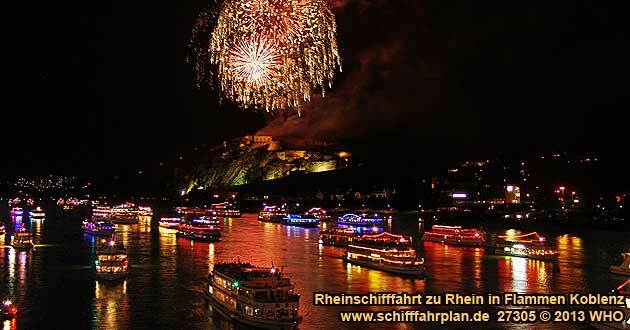 Return in Andernach on the Rhine river about 12:30 a.m. Boat tickets together with 2-course menu per person 107 EUR. Embarkation in Rudesheim on the Rhine River (right Rhine River side) from 4:35 p.m., departure 4:45 p.m. Seating place below deck on a passenger boat, on board music from the CD player. Disembarkation only possible in St. Goarshausen about 2:00 a.m. Return to Rudesheim with own car. Boat tickets incl. dinner per person 93 EUR. Departure in Bingen on the Rhine river (left Rhine river side) 5:15 p.m. Seating place below deck on a passenger boat, on board music from the CD player. Disembarkation only possible in St. Goar about 2:00 a.m. Return to Bingen with own car. Boat tickets incl. dinner per person 93 EUR. Departure in Assmannshausen on the Rhine River (right Rhine River side) 5:30 p.m. Seating place below deck on a passenger boat, on board music from the CD player. Disembarkation only possible in St. Goarshausen about 2:00 a.m. Return to Assmannshausen with own car. Boat tickets incl. dinner per person 93 EUR. Departure in St. Goar on the Rhine river (left Rhine river side) 7:20 p.m. Seating place below deck on a passenger boat, on board music from the CD player. Return in St. Goar about 2:00 a.m. Boat tickets incl. dinner per person 93 EUR. Departure in St. Goarshausen on the Rhine river (right Rhine river side) 7:45 p.m. Seating place below deck on a passenger boat, on board music from the CD player. Return in St. Goarshausen about 2:00 a.m. Boat tickets incl. dinner per person 93 EUR. Embarkation in Koblenz on the Rhine river (left Rhine river side) from 3:30 p.m., departure 4:00 p.m. Background music on board. Return in Koblenz on the Rhine river about 12:00 a.m. Boat tickets together with welcome drink and gala buffet per person 132 EUR. Embarkation in Koblenz on the Rhine river (left Rhine river side) from 3:30 p.m., departure 4:00 p.m. Background music on board. Return in Koblenz on the Rhine river about 12:00 a.m. Boat tickets together with welcome drink and gala buffet per person 128 EUR. Embarkation in Winkel in the Rhinegau (town part of Oestrich-Winkel in the Rhinegau, right Rhine river side, about 8 km east of Rudesheim) from 4:00 p.m., departure 4:30 p.m. Seating place below deck on a passenger boat, sole entertainer with live music on board. Disembarkation in Kestert about 1:30 a.m., from there bus transfer to Winkel in the Rhinegau, return about 2:30 a.m. Boat tickets together with return bus transfer and 2-course menu per person 119,20 EUR. Departure in Rudesheim in the Rhinegau (right Rhine river side) 5:00 p.m. Seating place below deck on a passenger boat, sole entertainer with live music on board. 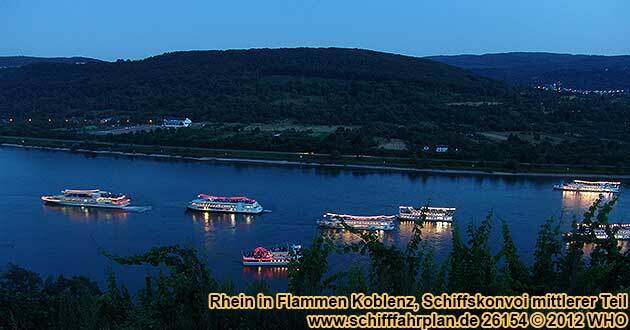 Disembarkation in Kestert about 1:30 a.m., from there bus transfer to Rudesheim in the Rhinegau, return about 2:20 a.m. Boat tickets together with return bus transfer and 2-course menu per person 119,20 EUR. Departure in Assmannshausen in the Rhinegau (right Rhine river side) 5:20 p.m. Seating place below deck on a passenger boat, sole entertainer with live music on board. Disembarkation in Kestert about 1:30 a.m., from there bus transfer to Assmannshausen in the Rhinegau, return about 2:10 a.m. Boat tickets together with return bus transfer and 2-course menu per person 119,20 EUR. Departure in Bacharach on the Rhine river (left Rhine river side) 5:45 p.m. Seating place below deck on a passenger boat, sole entertainer with live music on board. Disembarkation in Bad Salzig about 1:30 a.m., from there bus transfer with a minimum number of 20 participants (surcharge) to Bacharach on the Rhine river, return about 1:50 a.m. 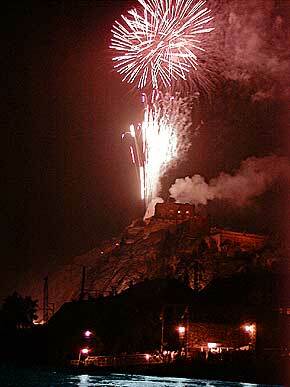 If there is no minimum number of 20 people, you have to organize the return to Bacharach by yourself. Boat tickets together with 2-course menu per person 105,80 EUR. Departure in Kaub on the Rhine river (right Rhine river side) 6:00 p.m. Seating place below deck on a passenger boat, sole entertainer with live music on board. Disembarkation in Kestert about 1:30 a.m., from there bus transfer to Kaub on the Rhine river, return about 1:50 a.m. Boat tickets together with return bus transfer and 2-course menu per person 119,20 EUR. Departure in Oberwesel on the Rhine river (left Rhine river side) 6:20 p.m. Seating place below deck on a passenger boat, sole entertainer with live music on board. Disembarkation in Bad Salzig about 1:30 a.m., from there bus transfer with a minimum number of 20 participants (surcharge) to Oberwesel on the Rhine river, return about 1:45 a.m. If there is no minimum number of 20 people, you have to organize the return to Oberwesel by yourself. Boat tickets together with 2-course menu per person 105,80 EUR. Departure in St. Goar on the Rhine river (left Rhine river side) 6:55 p.m. Seating place below deck on a passenger boat, sole entertainer with live music on board till stop in Kestert at about 1:30 a.m. Return in St. Goar on the Rhine river, about 1:50 a.m. Boat tickets together with 2-course menu per person 105,80 EUR. Departure in St. Goarshausen on the Rhine river (right Rhine river side) 7:00 p.m. Seating place below deck on a passenger boat, sole entertainer with live music on board till stop in Kestert at about 1:30 a.m. Return in St. Goarshausen on the Rhine river, about 1:55 a.m. Boat tickets together with 2-course menu per person 105,80 EUR. Departure in Bad Salzig on the Rhine river (left Rhine river side) 7:30 p.m. Seating place below deck on a passenger boat, sole entertainer with live music. Return in Bad Salzig on the Rhine river, about 1:20 a.m. Boat tickets together with 2-course menu per person 105,80 EUR. Departure in Boppard on the Rhine river (left Rhine river side) 7:50 p.m. Seating place below deck on a passenger boat, sole entertainer with live music. 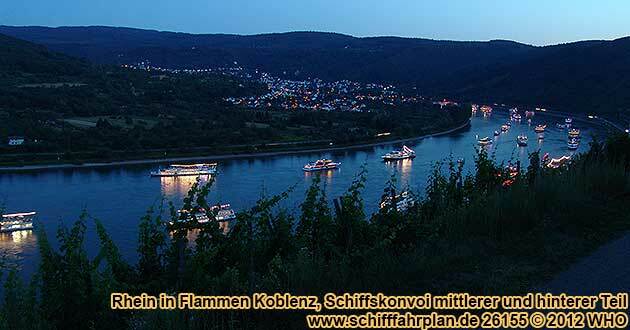 Return in Boppard on the Rhine river, about 1:00 a.m. Boat tickets together with 2-course menu per person 105,80 EUR. 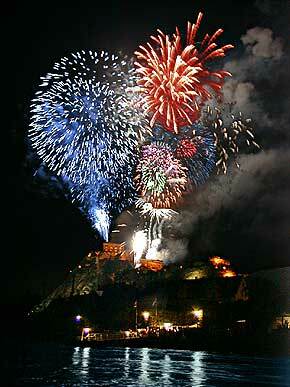 Koblenz: Fireworks from the castle Stolzenfels and the Konigsbacher brewery.